A handful of beautiful college girls take a Spring Break vacation to an isolated house to soak up the rays, booze, and boys, etc. 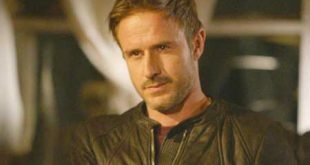 The problem is that they encounter a menacing muscle car on the way up to the house and find themselves fighting for their lives as they are stalked by an unknown assailant. What’s better than Spring Break for young and nubile college vixens? Well, for my money it doesn’t get much better in a horror film. I mean, I’m a red-blooded American male who loves horror films, and let’s just say that, like the old saying goes: where’s there’s smoke there’s fire… where there are hot chicks in Spring Break slasher movies, there’s… well… I think you know where I’m going with this. 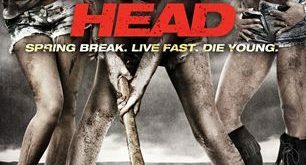 That’s why I was excited when I was tasked with reviewing the film, Machine Head, also known as Spring Break Killer from 2011. As I started to watch this movie, there was a couple observations that I immediately made. First of all, I was right with that whole “smoke and fire” thing, and that this film was another entry into the sea of low budget slasher movies. I don’t mean to sound as if that, on its own, is a bad thing, but with these films, there needs to be something that makes this film stand out from the rest. That is to allow the younger sisters to tag along. It made me chuckle when, though the film was trying to setup the younger sisters, Nikki and Sarah (played by real-life twins Morissa and Alana O’Mara), as these two lame, goblin-esque sisters, it was easy to see that not being blond or made-up could not hide the good looks of these two sisters. What makes having little sisters along even worse is the fact that the three college girls are expecting a trio of cool and awesome (read: douchey) guys to come spend the week with them. The boys are driving up separately and will meet them at the house later that night. Along the way they are accosted on the road by a black muscle car. It spooks the girls, but it does not deter their drive to par-tay. The girls don’t waste much time getting changed, hitting the pool, and hitting the booze. One thing leads to another and we end up being treated to a full-on stalk and slash film. I was actually very impressed with this film while it was in its first act. Though the budget limitations were fairly obvious, the film does a good job of giving us an idea of who each of these girls are and the type of character they’re going to play. Again, it didn’t hurt that they were all gorgeous. As the film moved along, however, it seemed to lose the momentum that it established in the opening scenes of the film. The main problem with this film was that even though the characters were fine, they ended up getting stuck in the house and didn’t seem to have enough interesting things to do to keep me engaged. The film became somewhat monotonous as the killer outside didn’t seem to know any stalking or murdering techniques that the discerning horror fan hasn’t seen many times before. There was one character that was introduced later in the film that gave me a glimmer of hope that the story was going to be shaken up and some interesting things were about to happen. Without spoiling anything, this glimmer of hope was quickly doused. I’m not one to go on and on about how much I dislike a film, so I’ll make this short and sweet. I really feel like this movie had some potential to rise above the sea of mediocre low-budget slasher films. However, it never was able to do anything more than become just another entry to the endless swath of run of the mill movies that will come and go without much of a fuss being made.